Today I found myself jumping and jigging around with a large furry tail strapped around my waist. I had been invited to a preview of a new theatre production called Dusk devised and directed by David Harradine and Samantha Butler, artistic directors of Fevered Sleep. It will go on public release in mid- November at the Young Vic. While the production is meant for very young children, aged between 4-7 years, adults and helpers are invited, but they have to join in, too, even being daubed with special green paint on their face. A colleague, Sarah, and myself, were visiting with a view to developing interactive technologies that the children could subsequently express their feelings and reflections about the piece. Getting children as young as four to reflect on their phenomenological experience is quite a challenge – but one we were inspired to think more deeply about in light of having taken part. Dusk is set in a theatre where groups of children come into a darkened space and are met by a friendly host, who is wearing a tail. 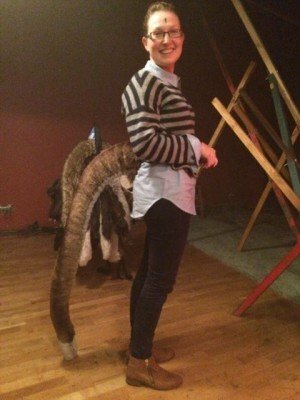 He makes fun of them not having a tail – thereby making them all want a tail. Piles of big bushy tails magically then fall from the sky and the children scramble to put them on. 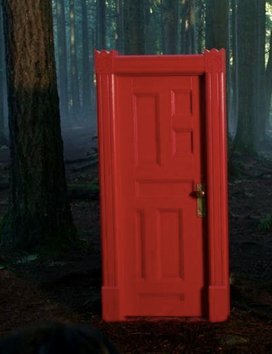 Tailed-up, they then follow him through an Alice-in-Wonderland like red door into a magical forest, where there are bright lights, stars, moons and trees. Not knowing what to expect or when to sit down or jump around with their tails they are like butter in his hands. The suspense is palpable and what is in store proves to be a real treat. The children are completely immersed in the experience – for well over an hour. Even the fidgety ones stop in their tracks and join in with all the others. Central to the piece is a 40 minute film that traverses the physical and the digital, time and place. A lost hybrid creature with horns and a tail wakes up to find he is all alone in the forest. He tries to find the other creatures he was playing with, before he fell asleep, and comes across the same door the children, at the theatre, have just entered. He walks though it and is confronted by an unknown world, where he experiences all sorts of emotions, from fear to joy. At various points he cries out in a haunting way, with the hope that someone will answer. Each time the children echo his cry sometimes spontaneously and other times egged on by the host. It was both mournful and joyful to listen to them bearing their soul, with heads high and mouths wide open – sounding like a pack of wolves. The narrative is about growing up, where the hybrid creature crosses mountains, seas, forests and terrains on a long and often lonely journey. He eats flowers to survive and takes comfort from seeing an owl, a deer, a snail and a beetle. Through his journey he comes across men destroying a forest using menacing logging equipment and then when he finally enters a city he sees a tree caged in by wrought iron – intended to protect it. Paradoxes like these of being unprotected but needing to be protected and being protected but needing not to be protected are one of many that are traversed through the piece. There is a lot going on – a rich layered tapestry of meanings. What would a four year old make of it all? Judging from their faces – a lot. At various points of the journey it looks like the creature is about to make it home but in classic Shakespearian style some other obstacle or challenge gets in the way. During these moments, the children instinctively turn their heads to the physical door at the back of the theatre forest that they entered through – waiting in suspense for him to appear in person and then when he doesn’t, swivel their heads back to watching him virtually on the screen in front of them. Each time it occurred, it was for me a wonderful moment and so clever – the kids traversing the physical and digital and back again in seamless and seamful ways. They seem to know when he will finally come home. Rather than jump out of the screen – like in the movies – he eventually and somewhat hesitantly comes through the physical door. He then wanders through the undergrowth where the children are sprawled and seated, kicking their tails and touching their faces, to make sure they are real. He then whoops them up into a crying frenzy and then spontaneously they are up on their feet, following him in his special tail-jigging dance. And all the adult audience members and helpers who had donned tails (called ‘big its’ by the host) find themselves joining in, spellbound and smiling – and that is how I ended up jigging on the spot with a whooshing large furry tail behind me. The piece is both a film and theatre and sometimes neither. From the programme blurb, it says it is “an invitation to see the world with our eyes and ears wide open, smiling awestruck. To slow down and to look.” Judging from the absorbed reactions of the little ones it seems the directors succeeded in doing more than that. It was a far cry from any Disney film, TV show or cartoon that they feed off during their daily screen time. Instead of a sea of faces fixated ‘heads down’ mindlessly staring at a screen, we witnessed a group of ‘heads up children, enraptured, alive and embodied – being both an audience and being a part, being there and not being there. That is mindful interaction and a joy for all to see.